Chapter One of our origin story centers around the Fiesta Bowl, an ill-advised lodging choice and ample sofa space at my friends Pete’s house in Tempe, AZ. Over the past nine years, we’ve traveled to watch the Beavers play at Cal, Stanford, Fresno State, USC, UCLA, the Fiesta Bowl, the Emerald Bowl and a very memorable trip to Baton Rouge, LA. Oddly, we’ve never watched an OSU game together in Corvallis, but we’re going to address that in 2010. 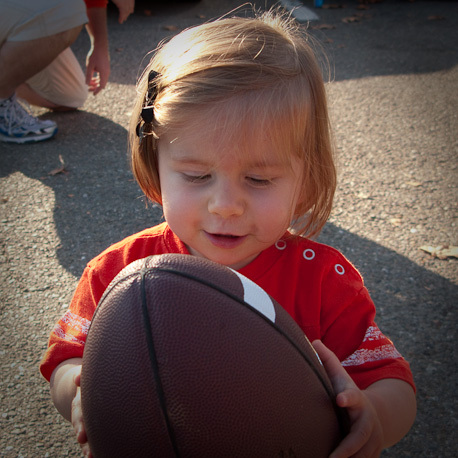 Autumn attended her first OSU game in utero and was born a few weeks later during halftime of a huge upset win over USC. Our story is inextricably tied to Oregon State football. 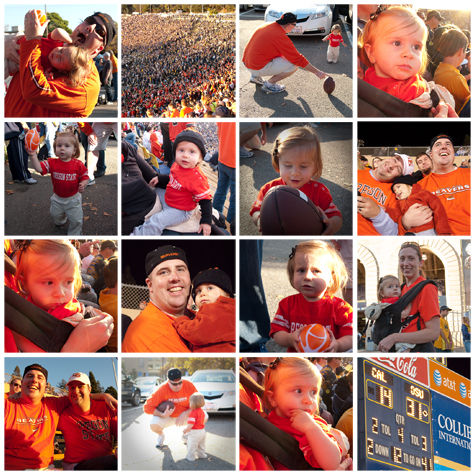 To say we were excited about Autumn’s first live Oregon State football game is a huge understatement. OSU and Cal are both great teams, with OSU exceeding expectations this year and Cal falling a bit short. Memorial Stadium in Berkeley is a favorite venue and gracious friends (Cal alums) invite us to their tailgater every other year. Our outlook was realistic. Three-plus hours in the bleachers isn’t terribly stimulating for a one year old. If Autumn managed two quarters of ball, we would give ourselves a W.
No offense to Jacquizz, but Autumn takes MVP for the day. Geared up in orange and black, she managed two hours of tailgating and four quarters of football with minimal fuss and a passing interest in what was happening on the field. And the Beavs kept their Memorial Stadium winning streak alive. Final score: OSU 31, Cal 14.